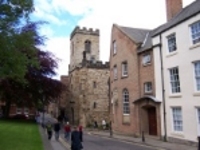 Durham's colourful local history museum is housed in a medieval church, offering some interactive, fun and interesting exhibits that detail the story of Durham, from ancient times to the present day. Situated close to the UNESCO-listed cathedral and castle, the Durham Heritage Centre contains a varied collection of artefacts. Exhibits include fascinating items like the 'Death Chair', used to carry sick boys from Durham School to the infirmary in days of yore, and a chilling recreation of a cell from the notorious Northgate Gaol. The Heritage Centre also has a brass-rubbing centre and offers an audio-visual show of the history of the town. A highly recommended attraction, budget at least two hours to take it all in.